"Vegas" Dave Oancea won $2.5 million in 2015 after betting just $140,000 on the Kansas City Royals to win World Series. It was widely reported in the Las Vegas Sun and other media. According to Mel Magazine, one week into the season Dave placed bet at 30-1 odds and got the largest payout futures bet win in the history of gambling. 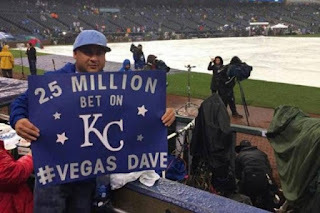 Many may not know, Dave started his career as a professional gambler by taking a student loan of just $10,000. With the money he went to Vegas and surprisingly put it all on red. In an interview he said to had turned the 10 grand into 20 and from here his bankroll started too. The next day he dropped out of school and for a living began with betting on sports. Today, his current business is blooming. He places big bets on longshot sports results, and likely keeps a very close eye on his bankroll. However, there are some obstacles in his blooming business. After winning big no casino allows placing a large bet in one go and so he has spread the bet around to fifteen different casinos in Las Vegas. It is surprising to know he is banned from Westgate and the MGM Grand. He is also limited at some of the casinos in Las Vegas. Dave said, "Vegas loves losers but hates winners." Share your views about such winner with us and fellow readers in the below given comment box.